Yesterday, one of our precious girls at GSF fell and broke her elbow. Joan (pronounced Jo-anne) is just a few months older than my Esther. They are friends and were playing together with other girls their age when she fell. 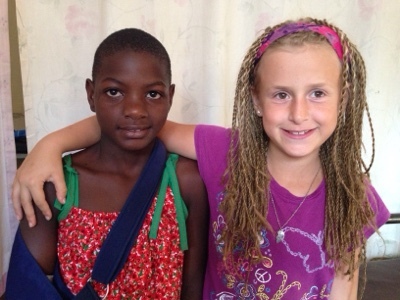 Here is a photo of these two girls together at the clinic. The nurse took her to Jinja, to one clinic to get an x-Ray, to another clinic to have the doctor read it, and then they were sent to a third clinic for meeting with the orthopedic doctor. It was too late, so he was not available and we needed to bring her back to town today. The orthopedic doctor saw the x-Ray and realized that setting these bones was going to require surgery and pins. Thankfully my dear friend Jennifer has worked as a surgical nurse, so she accompanied me to decide how to best proceed. After much discussion and prayer we decided to go ahead and admit Joan today. They are going to try to reduce the swelling overnight and set the bone tomorrow morning. She might be released by Tuesday at the soonest. Since hospitals here only provide a bed and the doctors, we needed to gather things for them to use, sheets, towels, blankets, pillows, mosquito net, basin for bathing, mattress for the nurse, soap, cup, drinking water, hot water, etc. Please pray for the nurse from GSF who is caring for Joan, for the doctor to have great skill and care in setting the bones and for Joan as this has been a very painful and scary experience. Thank you for your prayers! Joan sweetheart am praying for you and I have faith you are going to come out of this painful situation safe and sound because Christ's healing hand is upon you! Be strong it will all be over sooner than you expected. I love you!